While that obviously means paying attention to our physical health and fitness, what’s just as important is looking after our brain – for the same reasons. Just as our body needs to move, so does our brain. At some point, we all start to notice changes in our ability to remember things. This can happen at any age. You forget the name of a good friend... or open a cupboard and can’t remember why. Shopping lists that were once easy to remember now need to be written down, and things like appointments sometimes completely slip your mind. It’s natural to occasionally forget things. Fleeting memory lapses are due to normal changes in the structure and function of the brain as we age. Yet by including mental activities and exercises into your daily routine, you can enjoy the benefits of a sharper mind and a healthier body for years to come. Here are 12 easy and enjoyable ways to help maintain your brain and enjoy your retirement lifestyle. 1) Use it – or lose it! While the old saying ‘use it or you’ll lose it’ may not be literally true, you can however stimulate connections between nerve cells that may help your brain generate new cells. Any activity that is mentally stimulating can help build up your brain. So it’s more a case of ‘use it to improve it’! Certain foods (such as fatty fish, blueberries, turmeric, and even coffee) are known to support healthy brain function. It’s also been shown that people who eat a Mediterranean type diet of mostly fruit, vegetables, fish, nuts, unsaturated oils (olive oil) and plant-based proteins are less likely to develop cognitive impairment and dementia. Consult your doctor or dietician to discover which foods might support your brain to function at its best. Not only can you teach an old dog new tricks, but it turns out that it’s actually good for the old dog! During your working life, your brain was keeping constantly active. Whether it was running a business or running a household, your brain was continually challenged and stimulated. That’s why it’s important to keep up this brain activity in your retirement. This is the perfect time to explore new interests, acquire different skills, and continue to give your brain a few challenges. Learning is a great way to build and preserve your brain cells. Be sure to follow the advice of your professional medical practitioner before making any dietary or lifestyle changes. Setting up systems around your home will allow your brain the space it needs to concentrate on learning and remembering new things. Create a place to put your keys, purse and phone, a shopping list on the fridge, and a diary for appointments, birthdays and special occasions. You’ll find getting organised will also keep you calm, because you won’t have to worry about where you put things, where to store things, or whether you’ve lost things! De-cluttering your home can also help remove the clutter from your brain to help you to think more clearly. Worrying about all your ‘stuff’ can take up a lot of time and energy. Clearing your clutter helps minimise distractions, so you can focus on new information that you want to remember. When you were younger, it may have been easy to multitask and get many jobs completed at the same time. As you age however, trying to do two things at once can actually create more problems than it solves. So instead, try to just focus on doing one task at a time. You’ll probably find it improves your concentration, reduces your chance of getting flustered, and helps you to be more productive. Here’s a little tip for retaining information. Repeat it! If you’ve just met someone, ask them to repeat their name and then say it back to them out loud in conversation. This way your brain hears the name several times and is more likely to retain it. And here’s a bonus tip: when you place one of your belongings somewhere other than its usual spot, tell yourself out loud where you have put it. This may seem a little strange at first, but it will help reinforce the memory. A mnemonic is a tool to help remember facts or a large amount of information. It can be a song, rhyme, acronym, image or a phrase. Creating your own mnemonics for items such as those on your shopping list can make the experience more enjoyable and give your brain a little boost at the same time. Using your muscles helps both your body and your mind. That’s because exercise lowers blood pressure, improves cholesterol levels, and helps balance your blood sugar, which in turn supports a healthy brain and a healthy heart. Physical activity increases the flow of oxygen to your brain and releases endorphins – your body’s ‘feel-good’ chemical. Engaging in regular exercise can also help you relieve stress, overcome depression and gain a more positive outlook on life. All good reasons to keep moving in retirement! Just as moving your body is important, so is making time for rest and relaxation. Being anxious, depressed, sleep-deprived, or exhausted can take its toll on your brain and how it functions. We are not meant to travel this life alone. Surrounding yourself with people whose company you enjoy, who share similar interests, are at the same stage of life, and who you can share a laugh with will contribute positively to your mental wellbeing. Having strong social ties has also been associated with a lower risk of dementia, lower blood pressure, and longer life expectancy. All great reasons to surround yourself with people you care about and who care about you! If you’d like to see how our residents stay engaged and healthy at Renaissance Retirement Living, we invite you to visit us for yourself. Our Information Days are a wonderful introduction to the Renaissance lifestyle, in just the sort of relaxed and welcoming environment you’ll experience when you choose to move in. We’ll help you find the information you need to make the right decision for your needs. 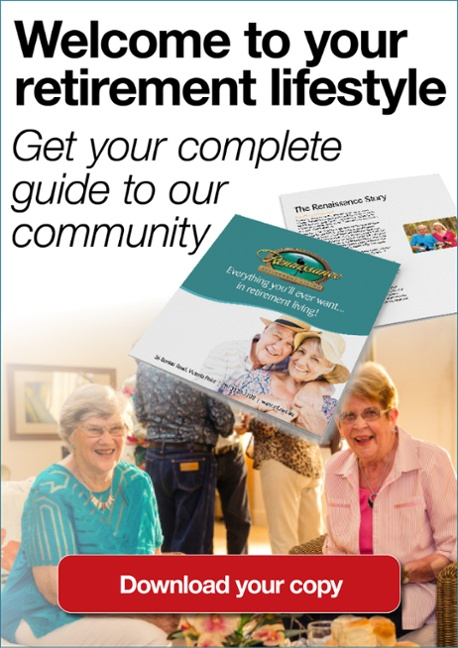 Call Renaissance today on (07) 3820 7700 or fill out the form here to find out more about the lifestyle you’ll enjoy at our outstanding Victoria Point retirement living.